Nextera’s Hosted IP PBX is a high-performance, low maintenance solution that gives your business a competitive edge. Hosted PBX delivers more functionality than a traditional business phone system all on a secure, managed, centralized platform utilizing the same connectivity for making calls and for internet service. 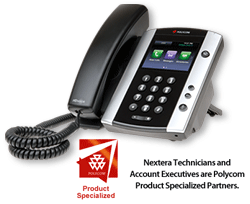 Nextera provides you with your broadband, IP Phones (Polycom®), long distance calling and advanced calling features. The service plans are flexible and completely scalable for business customers of every size. 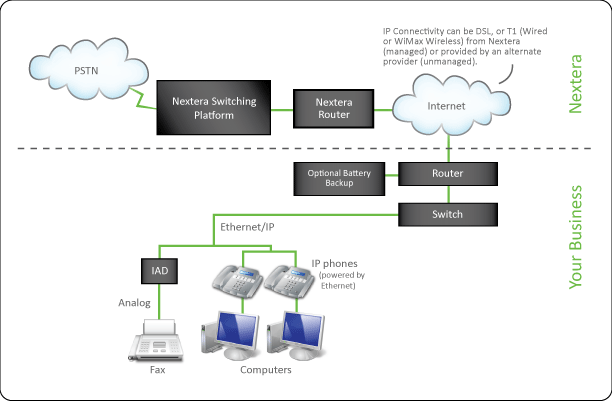 Nextera’s Hosted IP PBX service is a complete communications package that saves time and money! Nextera’s Hosted IP PBX service includes a host of standard features as well as a la carte optional features. For a complete list of included features, including descriptions, please click here. Increased Productivity: Innovative features dramatically improve the way you interact with customers and colleagues. Administrators and users easily manage and control all features from any web browser using MyNextera portal. Enhanced Image: Music on Hold, Customized Greeting for Callers and Auto Attendant functionality gives small businesses the tools that big businesses enjoy. Geographic Independence: Collaborate easily with remote employees. Free calling and 4-digit dialing between office locations and virtual phone numbers to expand market presence. Lower Operating Expenses: One vendor for all your voice and data needs. Combined with Nextera’s broadband DSL or T1 Nextera’s voice optimized network provides reliable connectivity and security while providing consistent, clear call quality. Nextera's HPBX Platform also provides businesses with optional enhancements. For a complete list of optional features and their descriptions, please click here. With Nextera’s Hosted IP PBX service, you can make and receive calls using the same broadband facility as you use for your internet service. All of the features and functionality are on a centralized platform which is managed by Nextera and reduces your upfront costs. The Hosted IP PBX service provides the broadband connection, Polycom IP phones, customer premise switching equipment, long distance calling plans and advanced calling features to make the all-inclusive business solution.